Healthcare providers are increasingly on the hook to improve the overall health of patients or face significant financial penalties. By 2018, the Centers for Medicare & Medicaid Services (CMS) will require 50 percent of payments to be value-based, meaning providers are compensated for healthy outcomes rather than each service provided. 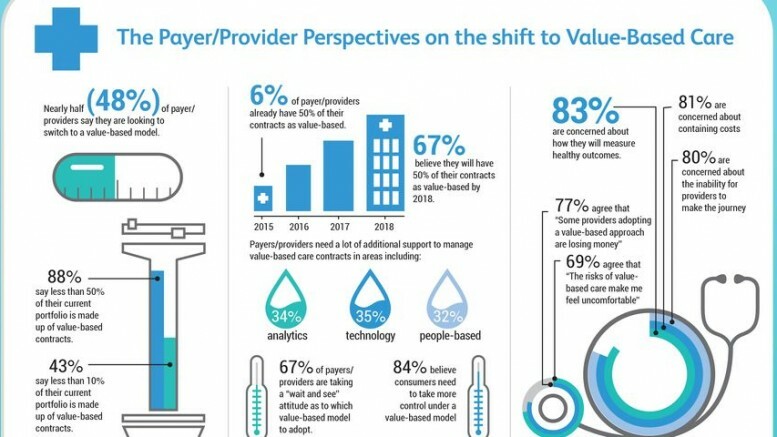 According to new research from Xerox (NYSE: XRX), 43 percent of healthcare providers and payers say value-based contracts make up less than 10 percent of their current portfolio, leaving much ground to make up. Xerox announced at HIMSS16 a full lifecycle population health management solution called Xerox Health Outcome Solutions. It is designed to help providers and at-risk organizations adapt to this new way of working by managing the health of patient populations so they are compensated for successful outcomes. Xerox’s research shows that 69 percent of healthcare providers and payers are uncomfortable with the risks of value-based care, and 77 percent agree that some providers are losing money by adopting the approach. Xerox addresses this concern by analyzing a provider’s underperforming value-based contracts and identifying opportunities to improve specific financial and clinical contractual outcomes. For example, Xerox may estimate that a hospital’s readmission rates will be deemed excessive by CMS and recommend areas of improvement in order to avoid a financial penalty. Analytics: Xerox’s Care Integration Services is used to assess a provider’s defined patient population and identify patients at risk of a preventable readmission based on insurance and pharmacy claims, Electronic Medical Records data and general demographic information. Clinicians and/or patient care coordinators develop a health profile for each at-risk patient and engage those patients with assistance that will drive healthy outcomes, like scheduling follow up appointments or filling prescriptions. Clinical and Para Clinical: Xerox increases the number of touch points between at-risk patients and healthcare professionals who can offer advice on staying healthy. Patients can call a 24/7 nurse line with non-emergency questions and for assistance when a symptom or complication requires follow up care. Xerox also offers access to health coaches who provide personalized patient engagement based on data from Xerox’s Midas+ Juvo Care Performance Platform. Technology: Xerox provides a health IT infrastructure so providers can offer telehealth services, a convenient and affordable way to deliver follow up care. Xerox offers a complete solution with cloud hosting, system integration, claims eligibility and claims submission to power telehealth services. Administrative: Patient services include health risk assessments, appointment scheduling and reminders, and patient onboarding, which ensures that patients understand their benefits and the services offered by their healthcare provider. Xerox Health Outcome Solutions is available to hospitals, Accountable Care Organizations and Integrated Delivery Networks, and will expand in the future to offer outcome-based solutions to the payer market. “Xerox’s depth of expertise within the healthcare ecosystem, including providers, health plans and state governments, along with capability for personal and digital support for consumers, positions the company to partner for a true, modern, lifecycle population health management solution,” said Barbra Sheridan McGann, HfS Research. Xerox Healthcare helps healthcare organizations focus on improving lives through better, more affordable and more accessible care by designing processes that work for the people delivering, enabling and receiving care.